If Gilbert patients are missing teeth, the All-on-4 implant procedure could be the solution that’s right for them. This simple process is perfect for replacing a full set of upper or lower teeth. With the help of Dr. Hanna Mansoor, patients can have a brand-new smile in just one day. Rather than rely on separate implants for each missing tooth, the All-on-4 system anchors a full upper or lower bridge of teeth with just four implants. Two implants are put near the front of the mouth, and two go in the back. This offers enough support to anchor the entire bridge, providing a seamless appearance that’s far superior to dentures or tooth-supported bridges. After the initial consultation, most patients need just one more follow-up session to complete the procedure. The four implants can be placed along with the replacement teeth in just one day, meaning patients can experience a complete transformation in less than 24 hours. What Are the Benefits of the All-on-4 Procedure? An easier recovery time, as there are only four implants being placed instead of multiple ones. The ability to have both the lower and upper jaws corrected at the same time. The preservation of jawbone tissue. Permanent teeth replacement that looks and functions like natural teeth. Improvements with speech and eating. Some patients might be wondering: why not just choose dentures? 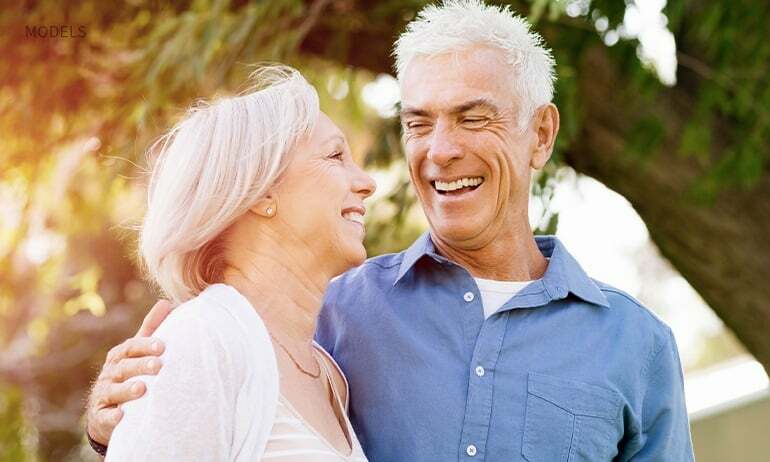 There are numerous reasons why the All-on-4 system trumps traditional dental appliances like dentures. For one, dentures do nothing to help preserve jawbone. Because dentures sit on top of the gums, chewing and biting with dentures does not stimulate the jawbone. Without proper stimulation, this bone begins to deteriorate. In fact, patients can lose up to a quarter-inch of jawbone in just one year after losing a tooth. What’s more, All-on-4 implants are permanent — they don’t come out of the mouth at any time, unlike dentures, which patients must remove to clean on a regular basis. At the initial consultation for All-on-4 implants, Dr. Mansoor will use 3-D imaging to determine if a patient is a good candidate for the procedure. She will also use these scans to create a custom-made bridge that fits the size and shape of the patient’s mouth. The procedure itself will take place right in Dr. Mansoor’s Gilbert office. She will use anesthetics to ensure patients feel nothing as she places the implants in four strategic places across the jaw. Once these are securely in place, she can fit the bridge onto the implants, allowing the patient to leave the Gilbert office with a dazzling and functional smile. What Is the All-on-4 Recovery Process Like? Patients will need some time to recover after the procedure. It takes several months for the new implants to fully integrate into the jawbone. During this time, patients may need to stick to a specific diet and avoid smoking or other tobacco use. Once the implants have successfully bonded to the jawbone, they will be strong enough to hold the permanent bridge in place. Dr. Mansoor will create this using the latest innovations in 3-D scanning. The resulting bridge will provide a massive aesthetic improvement, as well as assist patients with chewing easier and speaking more clearly. Caring for these new teeth is just like caring for real teeth. Patients will need to brush, floss regularly, and use a waterpik as well as schedule professional cleanings twice a year to keep them in good shape. Because All-on-4 implants provide a complete set of upper or lower teeth, this technique is best used in patients who have lost all or most of their teeth. Otherwise, any remaining teeth will have to be removed before the procedure can be completed. Additionally, patients need to have a solid amount of jawbone, so the four implants can anchor securely. If patients do not have enough jawbone to support the All-on-4 system, traditional implants paired with bone grafting may be a better option. For patients who qualify, All-on-4 implants are a quick and easy solution to lost teeth in the mouth. Under the experienced care of Dr. Mansoor, Gilbert, AZ patients can rest assured their new smile will meet all their expectations. Best of all, the transformation will be complete in just a single session, which is far less than the time it takes to get traditional implants. To learn more about the All-on-4 system and see if you qualify for this amazing implant procedure, call Smiles by Hanna at (480) 279-3700 to schedule your initial consultation.